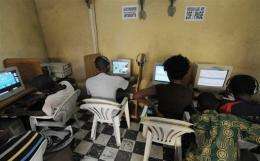 Young people browse the Internet in a cybercafe in Abidjan in August 2009. Laws regulating cybercrimes must target individuals and not society as a whole, an IT specialist told an Internet governance forum at the Egyptian resort of Sharm el-Sheikh on Tuesday. Laws regulating cybercrimes must target individuals and not society as a whole, an IT specialist told an Internet governance forum at the Egyptian resort of Sharm el-Sheikh on Tuesday. Gisele Da Silva Craveiro from the University of Sao Paolo in Brazil said the broad nature of cyberlegislation leaves it open to abuse by authorities. "Definitions for cybercrimes can be so broad as to fit everything... leaving the laws open to inappropriate use by authorities such as monitoring citizens," Craveiro told AFP on the sidelines of the Fourth Meeting of the Internet Governance Forum in Egypt. "Technicians need to communicate with lawyers to come up with more efficient legislation so that society doesn't end up paying the price for too broad a legislation," she said. Craveiro was speaking at a session entitled Developing Comprehensive Cybercrime Legislation organised by the Council of Europe at the Red Sea meeting. "Legal frameworks should take into acount the rights of users and the role of the private sector on the one hand, and security concerns on the other," the Council of Europe said in a statement. While broad legislation can mean the potential for misuse, targeting specific offences means having to regularly update laws to catch up with the meteoric evolution of cybercrimes, some said. "You need to have a mix and match addressing specific offences but also taking into account new technologies and cybercrimes," said Pavan Duggal, Chairman of Cyber Law and IT Act. Committee in India, where data theft and unauthorised data use is posing the biggest challenge in cyberspace. The Council of Europe Convention on Cybercrime is currently the only binding legal document designed to criminalise computer-related offences, content-related offences and offences relating to infringement of copyright and associated rights. The IGF forum in Egypt has grouped more than 1,500 representatives of government, civil society, advocacy groups and the private sector from more than 100 countries to discuss the future of the Internet.